Toronto, February 12, 2019… Today Music Director Elisa Citterio unveiled Tafelmusik Baroque Orchestra’s 2019/20 season, which highlights the freshness and vigour at the heart of everything Tafelmusik undertakes. Old meets new in unprecedented ways, including Tafelmusik’s first-ever foray into the music of the late Romantic composer Tchaikovsky, a new multimedia program by Alison Mackay, the return of Vesuvius Ensemble, six world premieres by living composers, and Tafelmusik premieres of Lotti’s Missa Sapientiae and of Citterio’s own orchestral arrangement of Bach’s Goldberg Variations. 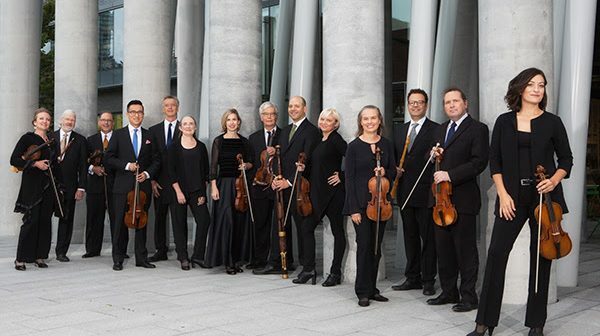 Citterio’s debut Tafelmusik recording, Vivaldi con amore, will be released in September 2019, and a live recording of A Handel Celebration takes place at Koerner Hall in May 2020. In November 2019 Tafelmusik returns to Europe for the first time in a decade, with soprano Karina Gauvin, and the critically acclaimed Safe Haven multimedia program will travel across Ontario in 2020. Tafelmusik’s newest member, double bassist Pippa MacMillan, joins the orchestra in September from England. A renowned specialist of historical bass instruments, she has performed with the Orchestra of the Age of Enlightenment, Handel and Haydn Society, and the Academy of Ancient Music. “Tafelmusik reaches millions of people through its artistic and community partnerships, touring, and recordings. In 2019/20 we look forward to extending our reach through new community access initiatives and dynamic programming that brings baroque music to life and makes it relevant to audiences today,” said Executive Director Carol Kehoe. The 2019/20 season opens with Tafelmusik meets Tchaikovsky (Sept 19–22, 2019, Koerner Hall). Elisa Citterio directs this program that extends Tafelmusik’s reach into an era where few period orchestras have gone before — the music of the late Romantic Russian composer Pytor Ilyich Tchaikovsky. The Serenade for string orchestra, op. 48, is paired with works by Mendelssohn — two string symphonies, and the Scherzo from A Midsummer Night’s Dream in a new arrangement by Elisa’s brother, composer Carlo Citterio. A world premiere by Cree composer Andrew Balfour completes the opening program of the season. In Baroque Roots (Oct 16–20, 2019, Jeanne Lamon Hall), Tafelmusik and Elisa Citterio return to their baroque roots in a program that offers a snapshot of the Italian influences on the music of 17th-century Vienna, when the sound of the baroque was breaking like a wave over Europe. Works by Farini, Viviani, Buonamente, Fux, and Vivaldi are coupled with a world premiere by Italian composer Guido Morini. Tafelmusik welcomes back Toronto’s Vesuvius Ensemble for a Christmas program infused with the warmth of the Italian countryside. O Come, Shepherds (Dec 4–8, 2019, Jeanne Lamon Hall; Dec 10, 2019, George Weston Recital Hall) combines baroque concertos and pastorales by Manfredini, Pasquini and others with the soulful folk-inflected music of Southern Italy performed on traditional instruments, including the ciaramella and the mandolin. This program features a special guest from Italy, zampognaro Tommaso Sollazzo, whose playing evokes the centuries-old tradition of shepherds accompanying themselves on bagpipes as they descended from the mountains at Christmastime. O Come, Shepherds includes a traditional Novena di Natale, an ancient ritual celebrating the nine-day period leading up to Christmas. It’s not often that Tafelmusik concerts are dominated by the sound of wind instruments. Gone with the Winds (Jan 16–19, 2020, Jeanne Lamon Hall) recreates the sonorities of the wind Harmonie — 18th-century wind ensembles that performed transcriptions of opera arias and music by Viennese masters. Gone with the Winds includes Mozart’s Serenade in C Minor, Beethoven’s Sextet, op. 71, and arrangements of arias from Mozart’s Così fan tutte and Rossini’s Barber of Seville. A world premiere by Canadian composer Cecilia Livingston rounds out this program. Dreaming Jupiter (Feb 6–9, 2020, Jeanne Lamon Hall) marks the first Tafelmusik concert guest-directed by a viola da gamba soloist. Italian composer and gambist Vittorio Ghielmi makes his Tafelmusik debut in this program showcasing the rich, beautiful sound of the viola da gamba, a cousin of the modern cello. Ghielmi has curated a selection of solo and orchestral music by quintessentially French baroque composers, including Marais, Forqueray, Lully, and Rameau, together with the world premiere of his own composition. One of the highlights of the 2019/20 season is Bach’s Goldberg Variations (Apr 22–26, 2020, Jeanne Lamon Hall; April 28, 2020, George Weston Recital Hall) in a new orchestral arrangement by Music Director Elisa Citterio. Inspired by Bach’s own practice of routinely reworking his music, Citterio offers her own musical translation of the composer’s timeless keyboard masterpiece in this new transcription for strings, winds, and continuo. The program opens with the world premiere of a work for harpsichord by Canadian composer Grégoire Jeay, performed by Tafelmusik’s Charlotte Nediger. The Indigo Project (Feb 27–Mar 1, 2020, Jeanne Lamon Hall; Mar 3, 2020, George Weston Recital Hall) is a new cross-cultural multimedia project created by Alison Mackayin collaboration with a father-daughter team making their Tafelmusik debuts, master percussionist Trichy Sankaran and world/fusion vocalist Suba Sankaran. This compelling musical journey explores the vast social, cultural, and political implications of indigo, the powerful blue dye whose impact can be traced from the European royal courts to the slave plantations where it was cultivated. The Indigo Project combines baroque music by Lully, Corelli, and others, and classical music from Southern India with stunning visuals and narration to create the kind of powerful live concert experience for which Tafelmusik is renowned the world over. Under the direction of Ivars Taurins since its formation in 1981, Tafelmusik Chamber Choir has been described as “the best period-performance choir anywhere in the world” (The Globe and Mail). Choral highlights of 2019/20 include music being performed for the first time along with masterpieces by Bach and Handel. Lotti Revealed (Nov 14–17, 2019, Jeanne Lamon Hall) marks Tafelmusik’s first venture into the music of Italian baroque composer Antonio Lotti. Taurins directs Tafelmusik Baroque Orchestra and Chamber Choir in the transcendent Missa Sapientiae. The mass is paired with choral music by Bach, Handel, and Zelenka — admirers of Lotti’s work, each of whom possessed manuscript copies of the Missa — along with the world premiere of a choral commission by Canadian composer James Rolfe. Tafelmusik’s annual performances of Handel’s Messiah (Dec 17–20, 2019, Koerner Hall) have become a cherished annual Toronto holiday favourite. In keeping with the message of peace, charity, and goodwill at the heart of Handel’s Messiah, Tafelmusik will once again collect non-perishable food items in support of Daily Bread Food Bank and other GTA food banks. Messiah guest soloists include mezzo-soprano Lucile Richardot, tenor Thomas Hobbs, and baritone Peter Harvey. An audience of more than 2,000 participates in Tafelmusik’s Sing-Along Messiah, directed by Mr. Handel himself at Roy Thomson Hall (Dec 21, 2019). Another choral highlight of the 2019/20 season is Tafelmusik’s performances of Bach’s St John Passion (March 26–29, Koerner Hall), a profound work based on text from the gospel according to St John. Ivars Taurins directs Tafelmusik Baroque Orchestra and Chamber Choir, along with guest soloists Jana Miller, soprano; Krisztina Szabó, mezzo-soprano; Charles Daniels, tenor; and William Sharp, baritone. The 2019/20 season concludes with A Handel Celebration (May 21–24, Koerner Hall), a banquet of music by one of the greatest musical dramatists of all time. Featuring guest soloists Amanda Forsythe, soprano, and Thomas Hobbs, tenor, this program includes favourite moments from some of Handel’s oratorios including Solomon, Semele, and Judas Maccabeus. A Handel Celebration will be recorded live for release on the Tafelmusik Media label—the first featuring both Elisa Citterio and Ivars Taurins with the Tafelmusik Baroque Orchestra and Chamber Choir. Tafelmusik audiences respond enthusiastically to a wide range of concerts tailored for different types of repertoire and experiences, presented in eleven different venues across the GTA. In addition to mainstage concerts at Jeanne Lamon Hall, Koerner Hall, Roy Thomson Hall, and George Weston Recital Hall, Tafelmusik presents three Haus Musikevents in informal venues and the third season of the Close Encounters chamber music series at Temerty Theatre in the TELUS Centre. In association with its summer and winter Institutes, Tafelmusik presents five free concerts at the University of Toronto Faculty of Music’s Walter Hall, Grace Church-on-the-Hill, and Jeanne Lamon Hall. Committed to making baroque and classical music fully relevant in a 21st-century context, Tafelmusik continues to develop and invest in ongoing community outreach and education programs for music lovers of all ages. These include free pre-concert chats for Tafelmusik audience members, free Education Concerts, free performances for the community in partnership with Health Arts Society of Ontario, Princess Margaret Cancer Centre, and the Toronto Plaza Hotel, as well as a coffeehouse-style program that will tour different neighbourhoods in the GTA. On tour, Tafelmusik animates smaller communities with live performances, education, and artist training, and provides study guides and other tools to open doors for continued exploration long after the applause has ended. Tafelmusik is thrilled to continue its collaboration with Opera Atelier and joins the company for the first season in its new venue, the Ed Mirvish Theatre, for Mozart’s Don Giovanni (Oct 31–Nov 9, 2019), and in Koerner Hall for Handel’s The Resurrection (Apr 11–19, 2020). Tafelmusik Baroque Orchestra is led by Citterio under the baton of Opera Atelier Music Director David Fallis. Canada’s busiest touring orchestra returns to Europe for the first time in almost a decade. The superb Canadian soprano Karina Gauvin joins Tafelmusik under the direction of Elisa Citterio for a program of orchestral works and opera arias by Handel and Vivaldi. Love & Betrayal tours to the United Kingdom in November, 2019. Safe Haven, Alison Mackay’s “highly effective and tightly-woven tapestry of words, music and art” (The Wholenote), explores the influence of refugee populations on the culture of their adopted countries, and is scheduled to travel to cities across Ontario in January and February 2020. The 2019/20 season will be a landmark year for the Tafelmusik Media label, with the release of Vivaldi con amore, the orchestra’s first recording with Elisa Citterio. This all-Vivaldi recording will showcase Citterio and members of the orchestra in concertos for violin, oboe, bassoon, and lute, underlining the level of virtuosity across the ensemble. Vivaldi con amore will be released in September 2019. A Handel Celebration will be recorded live in May 2020 for release on the Tafelmusik Media label—the first featuring both Elisa Citterio and Ivars Taurins with the Tafelmusik Baroque Orchestra and Chamber Choir. Tafelmusik continues to develop the next generation of local, national, and international musicians. Now in its 19th year, the Tafelmusik Baroque Summer Institute (TBSI) offers advanced students and professional musicians the opportunity to learn about period performance practice. The eighth annual Tafelmusik Winter Institute (TWI) is an intensive week-long training program in January, focusing on specialized orchestral study for select period players, culminating in a free public concert. The Baroque Mentors training program allows emerging artists to learn directly from Tafelmusik musicians and distinguished guest artists through university residencies and guest artist masterclasses. Additionally, as the Baroque Orchestra-in-Residence at the Faculty of Music, University of Toronto, Tafelmusik partners with the Faculty to expand the school’s period-performance program and to offer post-graduate studies.